Staff from iDigInfo will help facilitate a hackathon during the Extended Semantic Web Conference on Monday, May 27, 2013, Montpellier, France. 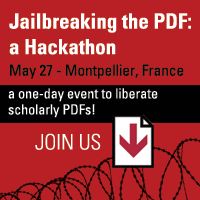 The hackathon aims to explore ways to access the data locked in PDFs and advance the Open Scholar movement. iDigInfo has been interested in working with large collections of scientific research and performing ontological analysis on the data within. The current application of interest is within the MSRC program, where iDigInfo is examining documents specific to suicide in order to help researchers more quickly assess a body of work.